Luang Phor Parn was born in 1875 (BE 2418) in Bang Nom Kho, Ayutthaya province. At a young age, He was given the nickname of "Parn" because of a red birthmark on his hand. Luang Phor Parn was ordained as a Monk on the 1st April 1895 (BE 2438) at aged 20. 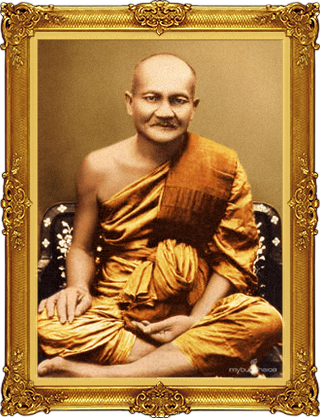 His teacher was Luang Phor Niam of Wat Noi, Supanburi. Luang Phor Parn interested in Buddha Dhamma and enjoyed learning it and seek approver from his parents before he ordained as a novice monk. He stayed at Wat Saket in Bangkok and practicing in the forest for many years. In 1931 (BE 2474), he returns to Wat Bang Nom Kho, he was titled as a heritable teacher of Buddhism. Luang Phor Parn was a meditative monk who reached superior levels of Vipassana (meditation). During Buddhist Dhamma, it was recorded that he reached the “Great six knowledge of miracles”, the knowledge of precognition, mind cleaning to stop next rebirth (Reincarnation). It was his great Dhamma practice that had cleaned and "distilled" his inner body (astral body) to crystal-like state which changed his body's cells immortal. Luang Phor Parn passed away in 1938 (BE 2481) at the age of 62. His body was un-decayed. Location: Wat Bang Nom Kho, Ayutthaya province.